Fitnat Katircioglu is a French painter of Circassian origin, born in Istanbul-Turkey. Her introduction to the artistic world was at an early age through her mother, artist, Jale Yasan. After graduating from the French Secondary school, Notre Dame de Sion, she went to Paris in 1971 and earned an art degree from the Nationale Superior Fine Arts School of Paris. While she was a young student in the the Nationale Superior Fine Arts School, her art became a great attraction to the art word. Her paintings are of Avant-Garde Visionary – Fantastic/Surrealist style and she applies old masters’ technique in the execution of her paintings. The themes are often about life, death, the birth of the world and its evolution, and the mystery of the universe, the struggle of men and nature for a better world and resolving various conflicts. She dreams of being able to live together in harmony and transform the world in a timeless universe where nature, in every sense of the term, in mutation can also “hide more images”. Through her paintings, she sometimes expresses black humor, suggests a story in itself, like a comic book or science fiction. “Arts-Sciences et Lettres” and awarded with the Silver Medal in June 20I8 & First medal in June 2014. The group Maxi-realists which exhibit each year at the Museum of Grand Palais – Paris. She is also an active member and shareholder of the Taylor Foundation since June 2010. She is affiliated to the House of Artists in France since many years ago as a professional visual artist. Fitnat was invited to participate in many solo and group exhibitions in Paris and throughout the world, mainly in Europe; in three of group exhibitions which, as a guest artist of honor at: Saint -Flour (Cantal/France), guest artist of honor at Saint-Ybard (France) in May 2015 and guest artist of honor at Ville Savin Castle (France), in April 2017. She was awarded with Silver medal in the exhibition of the Lonzac group show for her exhibited works. (Corrèze Limousin ) . Winner of Dream Art –Art Life contest in 2012 organised by Art Life in the professional category (painting). She also drew cartoons for a local political newspaper ( Saint -Mandé ), did illustrations , signs, many renovations and decorations of houses, apartments and shops. Some of her works were auctioned at Hôtel Drouot, in Rambouillet and Metz (France) and presented in their catalogues. Her name is mentioned in some books on odds painters and numerous publications in French and foreign press. She was interviewed on French radios and Italian television channels. Her paintings are in private collections in France and in several countries all over the world. From 1992 to March 2012 , she has been teaching courses of drawing , pastel, painting and live models in “Paris Ateliers” (the city of Paris ) , formerly known as “ADAC”. Recognized in the discipline of the international art of fantastic painting, visionary and magical realism, Fitnat, still lives at Paris and continue to paint in her studio. 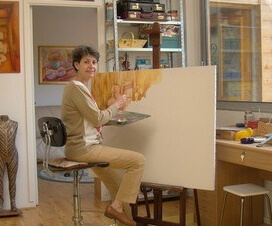 She still lives at Paris and continue to paint in her studio.